This first game is like Mother May I, only the jellybean colors tell the students what movements they should make. It’s a whole lot of fun and once the game play is over you have a great treat to share with the kids. You need jellybeans, a jar, a bowl, a glove and electrical tape. Tape a line on one side of the room and tape a line on the other. Fill the jar with jellybeans. Have the kids line up at the starting line. 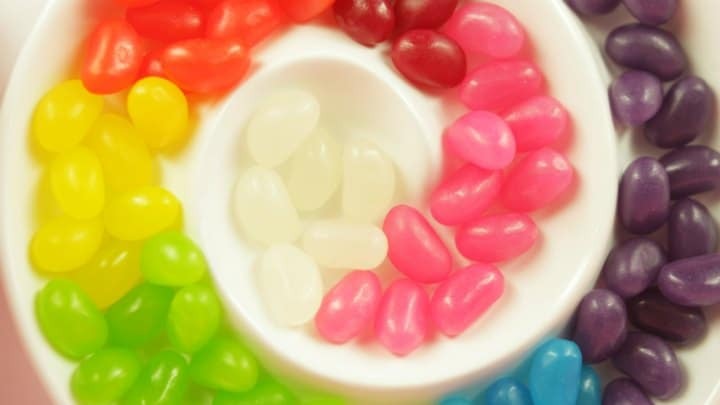 You’ll call their names one by one and then pick a jellybean from the jar. (Put your glove on first.) Have an extra bowl handy to keep the jellybeans you draw in. Whatever color you pick call out the activity to the player. Purple: Hop three times forward. Yellow: Take five tiny steps forward. Blue: Spin three times like a tornado. Pink: “Float” forward two times like an angel. Orange: Take one big slide-step. White: Uh-oh. Go back to the starting line. Green: Do nothing. March in place. Here’s what you need, four or five Dixie cups, plastic sandwich bags and jellybeans. Toss some jellybeans in the sandwich bags. Arrange the cups on the table. Kids will take a jellybean out of the bag and throwing it at the Dixie cups. The trick is they have to toss the jellybean with one arm behind his or her back. The person to get the most jellybeans in the cup in one minute is the winner. I like to divide the class up and let the kids play in groups. Read more from Mimi by following her blog at Tools for Kids Church. Don’t miss all our free lessons & ideas for Easter. Thank you so very much for your work . This is my first PK class . She’s an adorable , curly top . I know she will love our lessons . God Bless your ministry . Tony Kummer (Editor) reviewed & updated this page on : March 4, 2016 at 8:54 pm. All our content is peer reviewed by our readers, simply leave a comment on any post suggest an update.